Our fossilized walrus teeth are more than 2000 years old. Most have a beautiful brown bark that forms a natural frame. 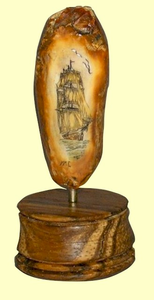 Let us make a scrimshaw Fossil Walrus Tooth display piece for your favorite display area, be it your desk or a shelf. These Fossil Walrus teeth are 1 1/2 inch to 2 1/4 inch long. When mounted on one of our beautiful hand-turned bases, the entire display piece is 2 3/4 inch high. Choose from one of our scrimshaw designs below at no extra cost. Or let us etch a picture of your own favorite boat or scene at a small extra charge. [These display pieces also make great small boat racing trophies when we etch your racing class on the front.] Handcrafted wood mounting options include hand-turned Walnut, Cocobolo, Oak or Cherry bases. Also available is the option of a handcrafted Sterling Silver base. Shown above is a Whaling Bark with Cocobolo wood base. Have us design this Fossil walrus Tooth as a pendant - with a hole near the top for a leather neck thong! Choose pendant option below.